Austin-based writer/director David N. Reyes’ comedy Trippin’ to the Altar follows the trials and tribulations of engaged couple Sam (Oryan West) and Katie (Lara Shah) as they plan their wedding day. Everything that could go wrong, goes wrong, as the couple argues over their budget, the location, Katie’s wedding dress, and Sam’s closest and loudest friends. Compounding their problems: Sam has hired a camera crew to film everything for a private video journal, which attracts the attention of a reality TV production company. Writer/director David N. Reyes combines a traditional narrative structure with mockumentary footage to tell Trippin’ to the Altar. The Austin-shot comedy marks the directorial debut of David N. Reyes, who specializes in making music videos, commercials, and corporate videos. 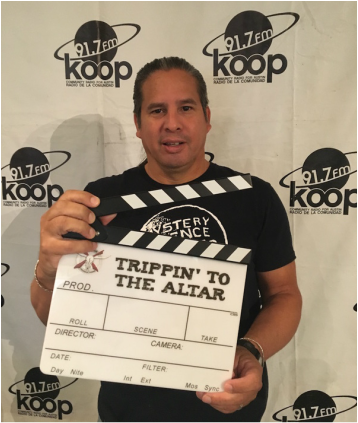 Trippin’ to the Altar will screen 7 p.m. Sept. 21 at the Alamo Drafthouse Slaughter Lane during the Austin Revolution Film Festival.